I have a masters degree in Chemical Engineering from Indian Institute of Technology Hyderabad with a thesis project in computational fluid dynamics. 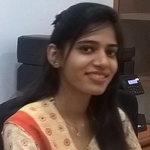 I have experience working on...Read moreI have a masters degree in Chemical Engineering from Indian Institute of Technology Hyderabad with a thesis project in computational fluid dynamics. I have experience working on Lattice Boltzmann methods, diffuse interface methods, volume of fluid and other interface capturing methods for fluid flow simulations. I have 2 years of teaching experience at bachelors level to engineering students as well. I am good at scientific research, literature survey and report writing as well. I need to solve optics physics problem. She is very good in mathematics and programming.